Celebrity chefs like Manjit Gill, Ritu Dalmia or Manish Mehrotra serves high-end customers every day. Dishes like pizzas, wraps and doughnuts are their everyday affairs. But not everyone is privileged enough to taste these tasty treats. 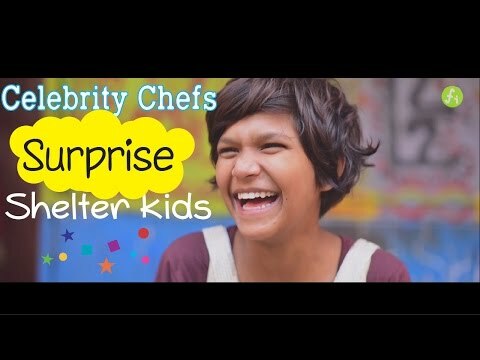 On 14th November, on the occasion of the children’s day, four celebrity chefs were asked to prepare dishes for 70-odd girls from a shelter home in Delhi, and they agreed happily. We are responsible for the society’s food. We treat our guests with great food all the time. This event gave me a chance to feed those children who are deprived of meals at costlier restaurants, said Chef Manjit Singh Gill. It was a special children’s day event organized by the NGO Feeding India. The Chefs who made the event successful are – Chef Manjit Gill (Corporate Chef, ITC Group), Chef Ritu Dalmia (Chef and co-owner, Cafe Diva), Chef Manish Mehrotra (Corporate Chef, Indian Accent) and Chef Abhishek Basu (Executive Chef, The Park). I am overwhelmed to be a part of this event. I got a moment to forget those troublesome clients and do something which is actually good, said Chef Ritu Dalmia, who made the pizzas as a treat for the kids. Later, chefs and kids joined to make a special banner that currently hangs at the centre of the shelter home. The idea of Chhoti Si Aasha was to fulfill the wishes of some children who are otherwise faced with countless challenges and difficulties. The Feeding India has fed 4,45,000 meals in 20+ cities over the past one year. The aim of the event was to show that if celebrity chefs can step out to serve food to these children on one day, then why can’t all of us help feed needy people regularly? The Magic Truck is the way to realize this dream, which will feed two meals to 1,000 kids every day, said Ankit Kawatra, founder of Feeding India.